The young girl represented in the alabaster bust still has a story to tell. Here serene expression and gentle smile are suggestive of a time in our history when Dutch and Flemish artists began to explore peasant life as an artistic theme in painting and sculpture. Although these themes were first popularized during the late Renaissance period from 1525 to 1600, our young lady is actually a product of the 19th century Renaissance Revival period, popular from about 1860 to 1880 here in the United States. The Renaissance was referred to as “Cinquecento”, short for “mille cinquecento” (1500), and is cited in numerous 19th century texts that discuss the inspiration for the Renaissance Revival era. Nearly every style from the previous two hundred years was re-invented and revived in the 19th century. The Renaissance Revival was just one of many major decorative art movements. An emerging middle class in America sought new ways to display their social status in their furnishings, dress, and social mores. One way they expressed their new-found wealth was by furnishing their homes with the most current decorative arts revival. Alabaster busts were quite fashionable during this time period, as well. More common are portrait busts of famous musicians, authors, and poets, who sat silently in the home libraries of the newly affluent and emerging middle class. Most Renaissance Revival themes focus on decorative elements like heraldic devices, gargoyles, dragons, and acorns. The silent maiden is suggestive of a more subtle appreciation of the Renaissance exploration of peasant themes. Attributing her to the correct revival takes a deeper understanding of this movement. The Impressionist and Art Nouveau art movements of the late 19th century rejected the idea of overly romanticized subjects. Precise and formal depictions of history were considered tediously dull. As a result, our young lady fell out of fashion shortly before the turn of the century. The art world was more concerned with spontaneity in artistic expression. Additionally, the value of fine art is largely dependent upon the reputation of the artist. 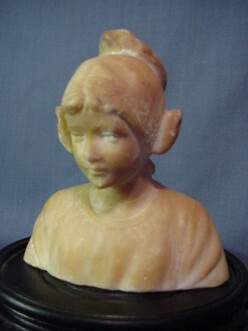 This 4” tall bust is unsigned, leaving us no clues to her origins. Fortunately, someone saw beyond the ever-changing dictates of fashion, and preserved the young girl with the timeless smile. Someone recognized the artistic merit of the piece without relying on a signature, and saved her from the rock pile. So what would she say if she could talk? Probably just “Thank-you”. She is valued at $200.00.